Edge of Eternity was born as an indie tribute by French developer Midgar Studio to the JRPG genre. The game managed to gather $161,246 in pledges during its Kickstarter campaign back in February, and it’s now in full production. During Paris Games Week, I met with CEO and Managing Director Jérémy ZELER-MAURY and we had a long chat about Edge of Eternity (and Hover – expect an interview on that one as well). After a short appetizer on some technical details of the game, here’s the full interview – enjoy! What kind of inspirations did you have for Edge of Eternity in the terms of lore and backstory for the game? In terms of lore, you will be surprised but there is absolutely no JRPG inspirations.The game is inspired by Western RPGs, like The Witcher. Edge of Eternity, even though the gameplay is a JRPG, it’s a dark fantasy game rather than light fantasy. There is conflict, there are people dying, at the entrance of cities soldiers are killing people, there’s a lot of violence and criminality. There’s also some inspiration from Skyrim, though the universe itself is more like Xenoblade and Star Ocean. Will there be blood in Edge of Eternity during fights, then? No. There will be lots of effects, but no blood. I don’t find the use of blood to be necessary, I think if you add an element to your game that should be something you want to pass. I think you can use blood to scare people, I don’t think that’s the kind of emotion I want to share with the game, which is mostly a balance between desperation and hope.There will be some moments where you’ll see people dying and you won’t know what to do to help the world, and in other moments you’ll have hope – that’s the kind of emotion I want to feed in Edge of Eternity. 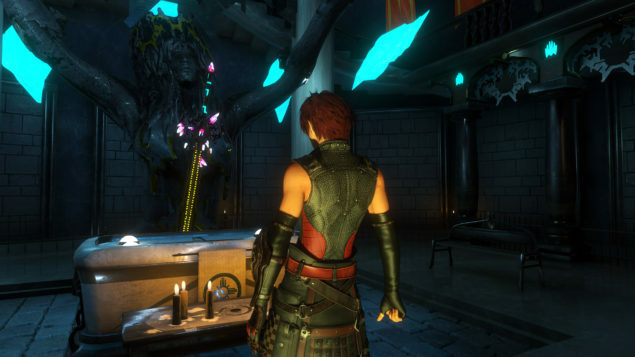 The game will have a non-linear main storyline, with player choices. Are these choices made through dialogues, like other WRPGs? The system is really at the core of the game, in the engine, so it can be set at every level. Everything can be a choice, but our goal is not to make choices specifically through dialogues. You have some choices that are questions to the player, but the thing is, if you create another save it won’t be the same experience and you won’t necessarily know why. It’s like a dynamic world, but the player doesn’t really know why the world is dynamic – it’s designed for players not to have the same experience twice. Will there be multiple endings because of these choices? Yeah, though things are more complicated than that. If things are okay, we want to do a sequel and choices will be brought over from the previous games. So yeah, it will affect the ending but the point is more to affect the future games and create a really different story that way. Kind of like The Witcher 3, where you can load the save from The Witcher 2. Yeah, but it will have a lot more impact than in The Witcher. There, it’s more like, “this guy is your enemy, this guy is your ally”; in Edge of Eternity, a city can be destroyed, a faction can be dead, your character can be a criminal, these are just a few examples. You also said there are random events in the game. Can you make a few examples? Random events are more like in an MMORPG, like Guild Wars 2. For example, if you don’t do a certain quest a certain faction can become stronger and attack a village, creating a random event. Day/night cycle and weather will affect combat, right? Yes. If a character has water under him/her, he/she will take double damage from electrical spells. Can we expect to see NPCs going to sleep at night, then? Yes, absolutely. Depending on the time of the day, that will happen. How long is the day/night cycle right now? It’s 30 minutes now, but it’s not final. It will be something that we’ll tweak depending on user feedback. It’s been a pain to have a cool atmosphere at each hour of the day, but I’m really proud of the work of my team. The levelling system seems to be inspired by Final Fantasy X with its maze-like structure. It’s actually quite different, because character level is not that important. You can level up, but the game is really oriented around weapons. Also, only the weapons change your characters visually and weapons can level, too. Each weapon has a different path and you earn crystals. So yeah, the progression might look like FFX, but it’s not per character, it’s per weapon. You don’t earn points by levelling, you get crystals by killing enemies and completing complex quests and you use crystals corresponding to a certain color to unlock a path. It’s more like the gem system in World of Warcraft. When you reach a specific level, usually half of the maximum level of a weapon, you unlock new branches. How long will it take to complete the game? We think that the main plot will take 40 hours to complete, and 200 if you want to also complete all the sidequests. That’s what I expect. The Kickstarter alpha will take one hour to complete. I remember that you made a Kickstarter update saying that you would have NVIDIA’s TXAA in the game. Yeah…But no. I was nearly done, but there is a feature that’s not working in Unity that I absolutely need, so I reported it to them. They said they would fix it, but there is no time frame, so it’s actually in pause. However, they said they would push an implementation of temporal AA in a forthcoming update, so maybe I will use that instead. But we’ll use the HBAO+ technology from NVIDIA, that is actually in the game, for PC only. For consoles, there will be a custom implementation of HBAO which is not as pretty, but close. Are you planning to support DirectX 12 in the PC version of Edge of Eternity? Yeah. We are dependent on Unity, also we work with two companies, Popcorn FX for the particles and trueSKY for the sky simulation, so we need all three to support DIrectX 12. But I think it will be okay to do it, once that happens. Actually, Edge of Eternity is running at FullHD on PlayStation 4 but only at 720P on Xbox One. I have a huge problem for running the game on Xbox One, but the PlayStation 4 version is really okay, at 30FPS (both versions). Can you maybe push it to 900P on Xbox One? I really don’t know. I’m really dependent on Unity for things like that, because I already optimized the game as much as I could. My artists, I put enormous pressure on them to push the limits of the engine, I’ve been working with Unity for 10 years, like you said it’s one of the best looking games on Unity. The only part that’s not optimized is the trees, they look really well with SpeedTree but the implementation of SpeedTree in Unity is really bad actually. If you removed the trees it would actually run extremely well even on a poor computer; we have a good relationship with Unity, so I’m pretty confident it will be solved in the future but I cannot say when it will happen. Is the esRAM the biggest problem? It’s the GPU. The graphics card is really a problem; more than that, the game runs at 720P but the map of the game is not complete yet. I think PlayStation 4 version will be okay, but I’m worried about the performance of the Xbox One version; I really hope Unity will make choices to change that, because it would be really sad to make changes like dropping details, I would be really sad in terms of creativity! Will Edge of Eternity launch on PlayStation 4 and Xbox One at the same time? I cannot say actually, because like with Hover I’m working on deals and I don’t know what Sony, Microsoft or other guys can propose, so it will depend on the offers we have. As an indie studio, it’s really important for us to survive. Thank you for your time, and good luck with the project.